Attack against President, the PMs plan! Hirunika Premachandra who joined the debate yesterday harshly criticised the President. “Mahinda realised that the snake will always be a snake. We ask the opposition to get up and walk away. The President cannot be trusted. Don’t fall into the same rut that we fell into. The President used others to achieve his own objectives,” said Hirunika, adding that she would vote against the President’s expenditure head. However, the President’s expenditure heads were unanimously passed in parliament yesterday without any amendments. When the first expenditure head was presented to parliament UNP-MP Chaminda Wijesiri got up and wanted a division. When the Speaker repeatedly asked if a division was required, Minister Lakshman Kiriella said there was no need for a division. Finance Minister Mangala Samaraweera too said there was no need for a division. With that the UNP backbenchers began agitating and even the Prime Minister found it difficult to contain them. 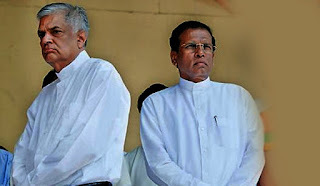 Then, Prime Minister Ranil Wickremesinghe stood up and said there was no need for a division. Thereafter the President’s expenditure heads was passed without a vote. After the parliamentary sessions ended many of the party leaders who represent the political parties within the government said the behaviour of the UNP backbenchers is unacceptable. Their stand was that they should work with the President with patience. Expressing his views, a minister said, “enough of being patient”. The Joint Opposition slogans are pertinent regarding the UNP as well.